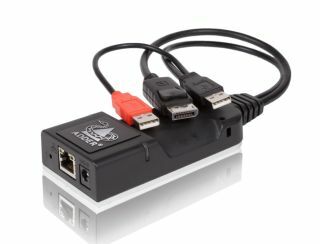 The What: Adder Technology will unveil its new Zero-U, IP-based KVM transmitter—the ADDERLink INFINITY 100T (ALIF100T)—at NAB 2018, booth SL4227. Developed in response to customer demand, it is the world’s smallest high-performance KVM transmitter, according to the company, and requires absolutely no rack space. The What Else: The ALIF100T USB-powered KVM transmitter is part of the ADDERLink Infinity solution. It can be retrofitted into existing infrastructure without the need for recabling, moving computers, or changing racking—reducing the overall cost of migrating from analog to digital. It can be plugged straight into the back of any computer like a dongle, taking up zero U if rack mounted and can hang from the back of the source. Highly scalable, it also enables broadcasters to grow their system over time without needing to accommodate new rack space. In addition, the ALIF100T uses only 2 watts of power, which ensures less heat is generated and less cooling is required, therefore lowering costs substantially. The device can also be powered directly from USB, meaning there is no need for power distribution units (PDUs), saving on further costs and negating the need for additional space. The Bottom Line: The ALIF100T is designed for video and audio broadcast operations in premium, high-demand locations where space and cost cutting is needed, such as control rooms, command and control centers, and more.